Emerging evidences suggest that host factors contribute to the occurrence in obese women of tumors exhibiting aggressive biology defined by advanced stage and high grade and propensity to metastasis (for review, see Dirat et al. Endocrine Dev, 2010 ; Wang et al. Cancer Lett, 2012). Obesity is also associated with an increased risk of aggressive, widespread prostate cancers. This association is poorly understood but a paracrine role of adipocytes in stimulating tumour progression is an attractive hypothesis. Using an original 2D co-culture system, we have demonstrated that murine and human tumor cells co-cultivated with mature adipocytes exhibit increased invasive capacities in vitro and in vivo. Adipocytes cultivated with cancer cells exhibit an altered phenotype in terms of delipidation and decreased adipocyte markers associated with the occurrence of an activated state characterized by over-expression of proteases, including MMP-11, and pro-inflammatory cytokines (IL-6, IL-1β). In the case of IL-6, we show that it plays a key role in the acquired pro-invasive effect by tumor cells. Equally important, we confirm the presence of these modified adipocytes in human breast tumors using immunohistochemistry and qPCR. Interestingly, the tumors of larger size and/or with lymph nodes involvement exhibit the higher levels of IL-6 in tumor surrounding adipocytes. Evaluate if the bidirectional crosstalk between CAAs and breast cancer cells is amplified in obesity conditions using both in vitro 3D coculture systems, murine models and human tumours. Investigate the adipocyte/tumour cross-talk in prostate cancer and melanoma. B. Dirat, L. Bochet, G. Escourrou, P. Valet, C. Muller (2010). 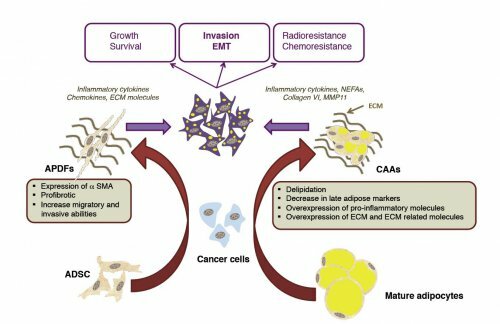 Unraveling the obesity and breast cancer links : a role for cancer-Associated Adipocytes ? Endocr Dev 19:45-52 (invited review).